Many people want to lose weight, but don’t want to feel hungry all of the time or eat food they don’t like. Let’s be honest…weight loss is difficult and dieting is a challenge. Building healthy habits takes time and people often grow frustrated when they don’t see results soon enough. You may want to eat healthy and lose weight, but perhaps you’re confused about how exactly to get the process started. There are many dieting options out there and experts disagree on which one is the healthiest choice. Many fitness and weight loss experts encourage people to eat several smaller meals throughout the day instead of three bigger meals. This dieting method is thought to increase your metabolism, which helps your body shed unwanted weight. We agree that this can be a great option. However, we want to warn against this method’s major downfall: the tendency to snack consistently. 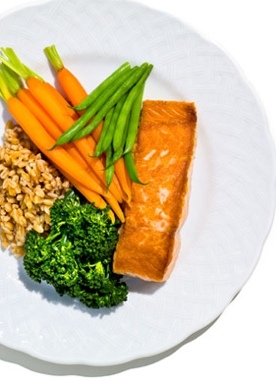 Eating smaller meals can be beneficial to some people, depending on your lifestyle and habits. If you’re the type of person that usually only eats one or two big meals a day, then having smaller meals more often will certainly be a healthier option for your body. Your body needs fu el throughout the day, so this diet option makes sense. However, if “eating several small meals” turns into constant snacking throughout the day, you could be doing more damage than good. Most snack food doesn’t offer your body much in terms of positive nutrition and so this method will not work for the long run. In order to lose weight, you have to pay attention not just to how often you eat, but also to what kinds of food you are eating. To provide energy for your body for the whole day, you need a formula that works. There are countless diet options out there that promise different formulas for success. Most people are just looking for one formula that actually works. Instead of arguing about the healthiest diet, we want to offer you a simple approach to weight loss. Unless you have *medical issues that complicate the weight loss process (such as diabetes or thyroid problems), this simple formula can work. Your weight will usually be determined by the number of calories you consume minus the number of calories your body burns. If you are eating more calories than your body can possibly use up during your daily activity, then you will gain weight. But if you can burn more calories than you eat, you should be able to lose weight. Therefore, results will fluctuate based on the caloric count of your daily diet as well as the intensity and duration of your physical activity. *As always, check with your physician before beginning any new diet plan. What’s the bottom line? Well, the point is that what you eat and how often you eat aren’t the only factors that determine or affect your weight. There are several aspects of a healthy diet plan. The nutritional/caloric value of your food, the frequency of your consumption and the amount of exercise you do. Focusing on formulas can become frustrating. However, if you continue to make healthy choices in every area of your life, weight loss will become easier – both emotionally and physically. Choose the healthier food options, complete some type of physical activity each day, and pay attention to your caloric intake. These steps will help you lose weight naturally and in a manner that is sustainable for the long run!